It is with great sadness that we announce the passing of our Dad, Don Applin, on Tuesday, August 21, 2018 at the Royal Columbian Hospital following a brief illness. He is survived by his daughters: Alexis (Candice), Allison (Shawn); grandson Yanni and many nieces, nephews and in-laws. Dad was predeceased by the love of his life, his wife Emilie, and his siblings Blanche and Cecile. 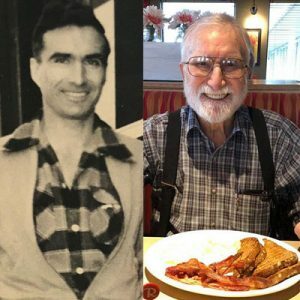 Dad had a full and an adventurous life which included service in the Canadian Army during WW2, working on the oil rigs in the far north, being a recovery diver for the RCMP, working on the Mica Dam and being a hunting guide in his youth. He was also an accomplished athlete, excelling at gymnastics, skating, horseback riding, swimming, boxing and body building. Dad will always be remembered for his love of fishing, tying amazing flies and his love of good ol’ bacon and eggs. I’m so sorry to lean of Don’s passing. My late husband Warren was a long time friend of Don’s and a school friend of Emily’s. Our Son Kevin worked with Don and they became good friends. We will remember good times shared in Kelowna. I know Don will be missed, he was a good man and we will remember. So sad to hear about Don. He was a true professional in whatever trade he engaged in, He had a sharp technical mind and a strong steady hand when it came to welding. He taught me a little boxing and introduced me to the speed-bag when we worked at the Revelstoke Dam. He had los of construction stories, good sensibilities, a kid-like chuckle and a genuine smile. 92…good for you Griz!